Next week we're starting again after the summer break. This time we're doing a whole raft of activities with Wolsingham School. We hope to produce a short animation based on an imaginary emigrant's diary. Some of the kids at Wolsingham come from Tow Law which is the Durham village left behind by John Hillary in 1879. Mr. Hillary a fervent Sunday School teacher set of to New Zealand with his family, but after a dismal six months of little work and no prospects returned home to Blighty. He travelled on the Westland (see my previous entry). 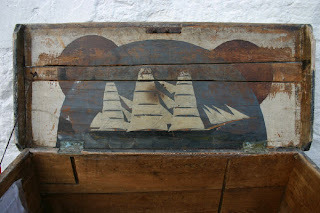 This picture came from the Mary-Ann's Cottage blog - it's a painting of the Westland on the inside of a sea chest belonging to Mary-Ann's father who was a sailor on the maiden voyage.